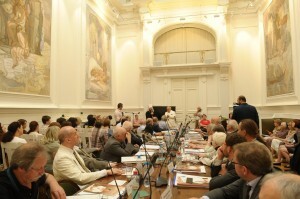 On June 11, 2013, the Presidium of the Russian Academy of Arts held a solemn meeting during which the RAA president Z. Tsereteli presented Metropolitan Hilarion of Volokolamsk, head of the Moscow Patriarchate’s department for external church relations, with the Order ‘For the Service of Arts’ in acknowledgement of his participation in the project ‘Arts and Religion in Modern Culture’. Addressing the RAA president and the Presidium, Metropolitan Hilarion said in particular that a monument to St. Paul, a work by Zurab Tsereteli, was opened on June 7 at the Greek town of Veria. ‘It is a great and significant event for both Greece and Russia, for Russian-Greek relations, and it adorned the visit to Greece by His Holiness Patriarch Kirill of Moscow and All Russia’, he said. Before the awarding ceremony, Metropolitan Hilarion visited the exhibition ‘Arts and Religion in Modern Culture’. Speaking about the theme of the exhibition, His Eminence stated, ‘Today the Church is present in diverse segments of our society, such as culture, arts, and education. Her presence in politics is not direct but rather indirect because many political leaders today listen to the voice of the Church, while the Church never interferes in political affairs or political struggle, for it contradicts her nature. The border between the sacral space of the Church and the profane space of the world will be there forever. ‘The Church exists to transform the world, to bring goodness and light to people and to make human life better and brighter in this world, filled as it is not only with good but also evil, not only with human virtues but also sins. 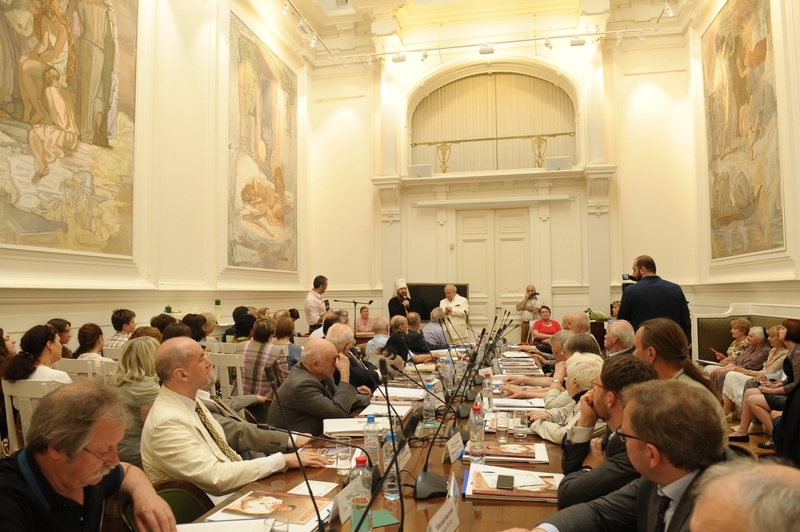 The Church never encroaches on the corporate borders of academies, institutes, universities but always responds when she or her representatives are asked to engage in cooperation’, he said. Metropolitan Hilarion expressed confidence that the Church’s cooperation with all the healthy forces in society was logical and natural, saying, ‘There is no clericalization whatsoever in it, no fusion of the Church with the state or various governmental and public institutions. It only shows that the Church has returned to where she was always present – to the very midst of the people’s life and social development, and she naturally interacts with civil society institutions’. Metropolitan Hilarion wished creative inspiration to those present saying, ‘Inspiration is a word from the church vocabulary, and when artists, writers, composers say that they were visited by the Muse or inspiration, we, religious people, see in this the work of the Spirit of God. None other but God Himself inspires people of art when they create their works to the glory of God – the works which help to make the world a better place’.